“What? Not another avocado mousse recipe!” I hear you say, I know, I know: every health blogger and clean eating guru worth their salt has one of these on their site. But, and it’s a big but for me, I adore avocado and always have done, even before it gained its recent cool credentials. I pretty much try and sneak it in wherever I can. When I was a teenager and ate meat, I used to love layers of roasted chicken, satay sauce and avocado between fluffy pieces of fresh white bread. Even then I had a penchant for testing different flavours combos. 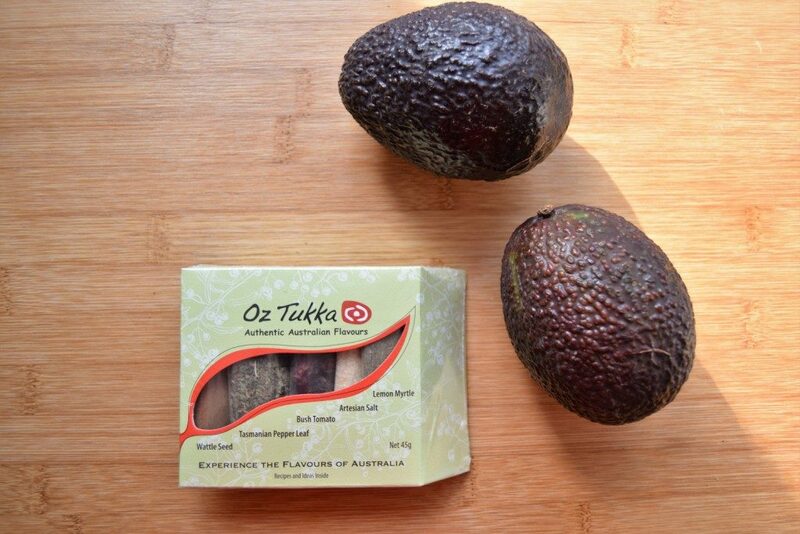 The Australian climate is very conducive to avocado growing and anyone going out for an Aussie brunch would expect to see avo on at least a few of the menu options. When I was back in Perth a couple of weeks’ ago, my mum and I walked past a house with an avocado bush growing over the front fence. It was full, and I mean FULL, to the brim with avocados. And this is when it’s winter time in Perth. It was almost enough to make me want to move home. Unfortunately we’re not so lucky with the weather in the UK; I’m sure it’s possible to grow avocados here, but I think it’s highly unlikely I’ll ever see a heavily laden plant draping itself over the footpath. Unless you’ve been living under rock, you’ll probably have noticed a big surge in avocado appeal over the last few years. Pop #avocado into Instagram and you’ll see what I mean. There was also the furore (and I use this in the loosest sense of the word) about Nigella’s ‘recipe’ for avocado on toast. I say, go for it Nigella! 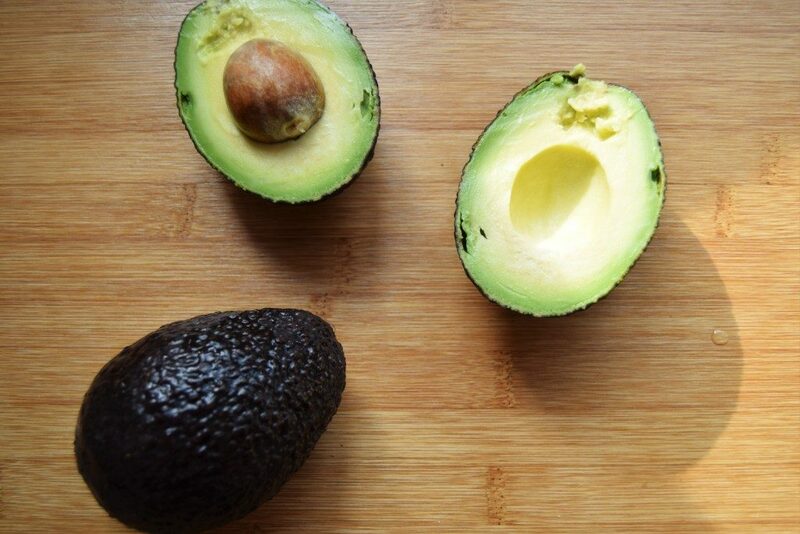 The more avo the better. I’m sure Waitrose will also be grateful as their sales of avocado rocketed by 30% after the avocado toast episode of Simply Nigella aired. A little avocado goes a long way. 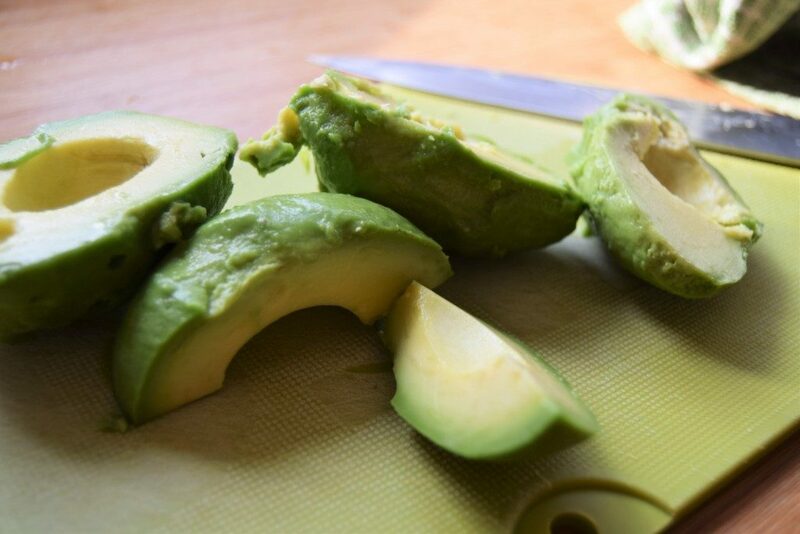 A quarter of an avocado sliced up is enough to have with eggs in the morning. I also love it chopped and popped on top of porridge. Avocado is a fruit after all, so it does also lend itself to sweet dishes. I really like the simplicity of the way it’s served for brunch at The Modern Pantry in London’s Finsbury Square, where it’s drizzled with deliciously nutty Argan Oil. Just a small word of warning, you might want to be a bit careful if you have IBS and are a following a FODMAP diet. Sometimes people with digestive issues find they need to limit how much avocado they eat as it has relatively high levels of fructose. I’ve learned this myself when my stomach’s been at it’s worst, but I just make sure I don’t overdo it. 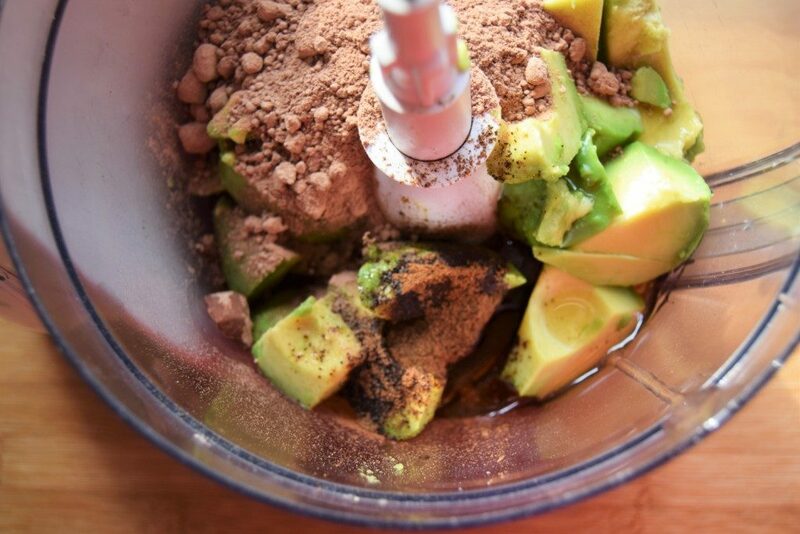 One flavour that works really well with avocado – and some people find this surprising – is chocolate. I love chocolate and I love avocado, so for me they are a match made in heaven. As avocado doesn’t have loads of flavour it’s a great foil for rich chocolate. I’ve even used avocado a few times in blind tasting activities in my workshops and quite often people can’t identify what it is when they can’t see it (especially if it’s not very ripe). 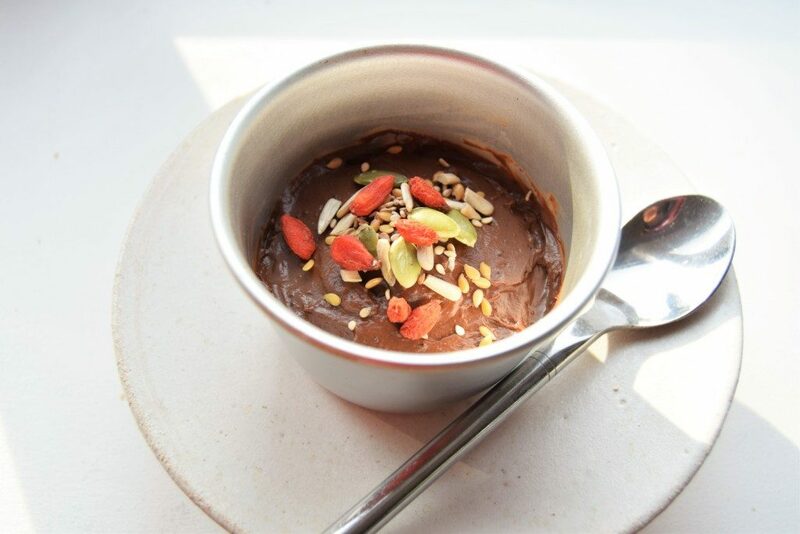 And it’s not just about the flavour; avocado is also good for chocolate mousse as it provides a lovely creamy texture. Given my love of avocado stems from my Aussie childhood, I also wanted to incorporate some indigenous Australian spices in the mousse. I brought back a lovely set of spices by Oz Tukka from my trip and includes something called wattleseed. Wattleseed has quite a nutty, coffee-like (and even a little chocolaty) taste, so is another natural partner for chocolate. If you’d like to get hold of some, you can buy wattleseed online in the UK from Spice Mountain. Otherwise you could substitute 1/2 teaspoon of fine espresso powder. I quite like the extra texture from the powder. 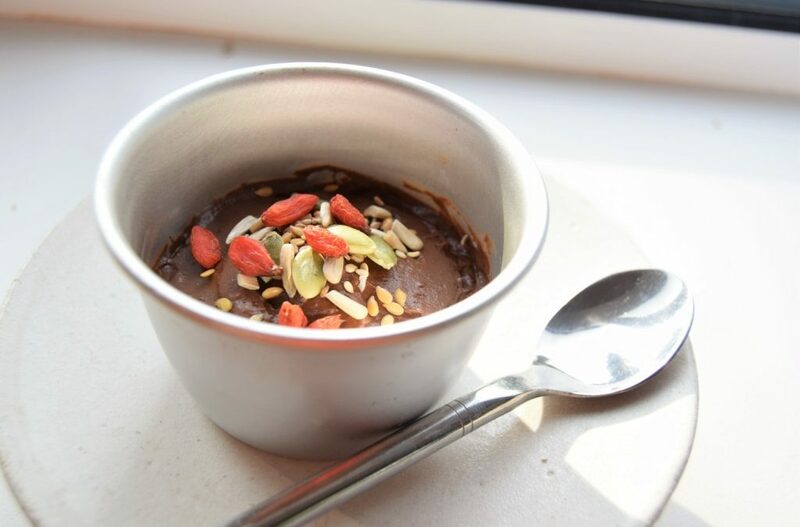 It’s not really the quite the same, but it will give your mousse an extra flavour flair. 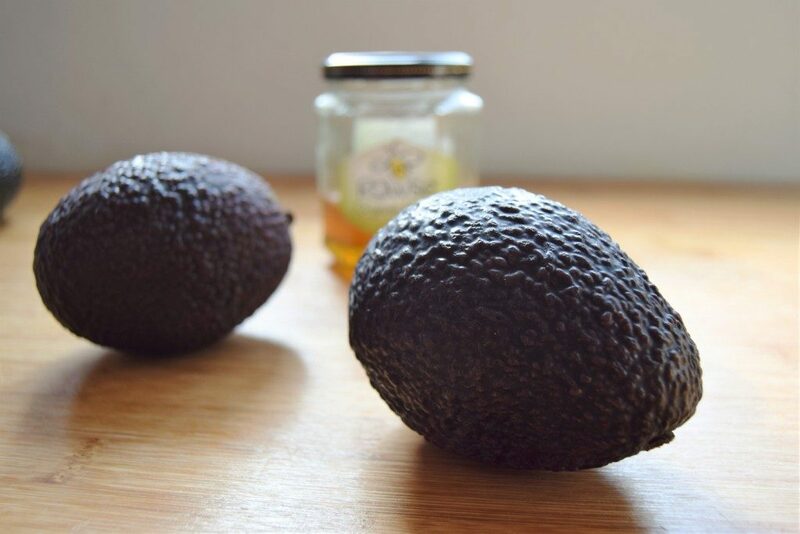 An extra little avocado tip… even when you press the sides to see if it’s soft, it’s not always apparent whether an avocado is quite ripe. To be absolutely sure, remove the little bit of brown stem at the top of the avocado. If it’s is definitely ripe, the indent should be green or on the way to brown. And to ripen an avocado quickly, pop it in a brown paper bag with a banana. I’m also going to be using this basic recipe (without the wattleseed) in my creATE Adventures In Chocolate session on Saturday. People will have the chance to experiment with some other flavours and textures to include in the recipe, so I can’t wait to see what gets added. If you try it out yourself, I’d love to see the results on Twitter or Instagram – just tag me in your photo and add the hashtag #creATE. Happy flavour muddling! 1. Put all the ingredients except for the milk in a food processor. 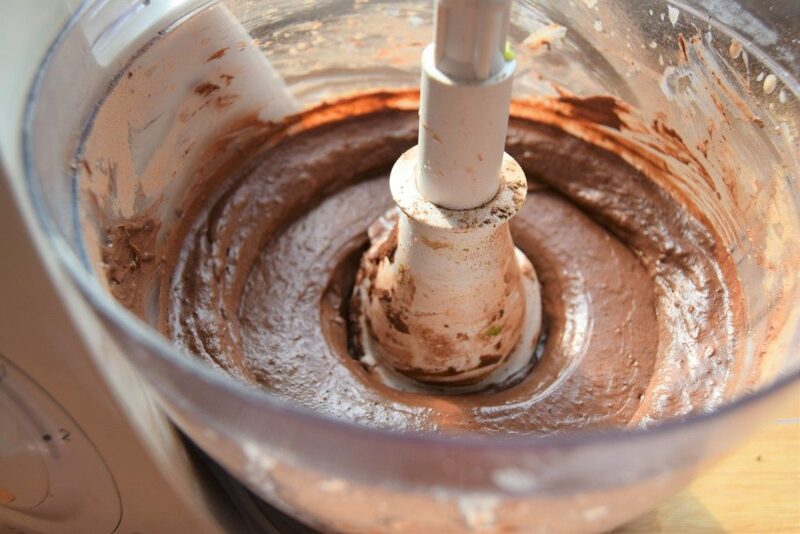 Blend for about 2-3 minutes until smooth. 2. Add the almond milk and blend for another few minutes until everything is completely mixed. 3. 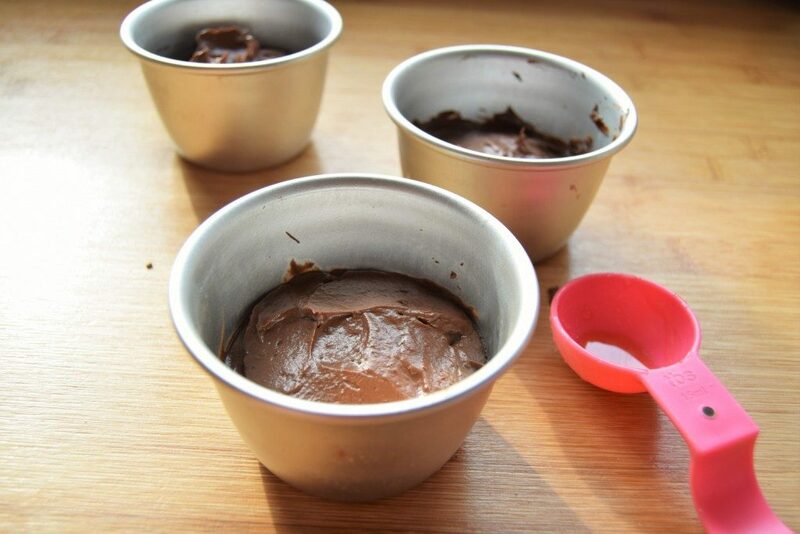 Scoop the mixture into ramekins or small dishes (egg cups are another cute option). The mousse is quite rich so you won’t need large portions. 4. You can actually eat it straight away if you want, but I prefer to chill it a bit and let the flavours mellow. To chill, cover and pop in the fridge for 1-2 hours before serving. A special thanks to Goodyfull for sending the lovely organic cacao powder to use in my classes. There’s also a discount code for Food At Heart readers to use. The code FOODATHEART will give you 30% off any Goodyfull products. It’s an Australian ingredient (but you can buy it online in the UK) – they are seeds from Acacia trees which are native to Australia. Let me know if you’d like any more information! They taste a little like nutty coffee and look like very small cumin seeds. Copyright © 2014 - Food At Heart. All rights reserved.